Austin Spillar, who helped write the Citizens Network of Protection’s proposal, discusses racial inequities in Evanston policing. Spillar modeled the proposal in part after ones already in place in Seattle and Oakland. Evanston residents demanded a more timely turnaround of police camera footage at a Wednesday meeting discussing Citizens Network of Protection’s police oversight proposal. They also requested it be as unedited as possible. CNP — a grassroots group that advocates for civilian-led policing — held the town hall-style event at Evanston Public Library to receive feedback about its Evanston Board of Police Oversight, Accountability and Transparency proposal, which it had distributed to about 400 Evanston residents in June. The proposal included a clause urging police to release videos as soon as possible, which residents who attended unanimously supported. However, residents also suggested that a sentence be added asking police to release unedited versions whenever legally possible. The proposal cites disparities in the percentage of police contact cards issued to each racial group in Evanston as a point of concern. According to a 2015 report from the Evanston Police Department, black residents are given about 73 percent of contact cards despite making up less than 20 percent of the city’s population. Residents’ discomfort with these discrepancies and the October 2015 arrest of Northwestern graduate student Lawrence Crosby — which many described as an incident of racial profiling — assisted in bringing about EPD’s pilot body camera program. Footage of Crosby’s arrest was not released until January 2017, over a year after the arrest. The pilot program equipped 11 officers with cameras early this summer and, as of late July, had collected 1,700 incident videos for the department, deputy police chief Jay Parrott said at a meeting that month. On Wednesday, Evanston police Cmdr. Joseph Dugan told The Daily the trial period had wrapped up and more information would be released shortly. 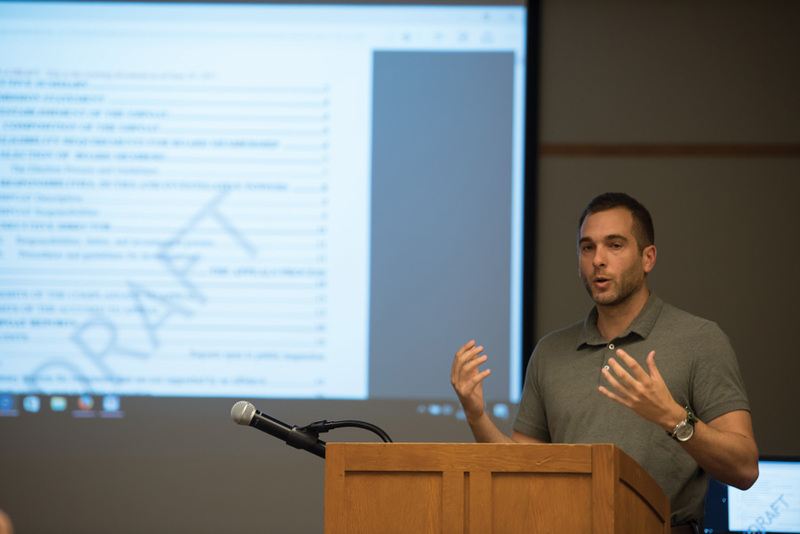 Austin Spillar, a recent law school graduate who has been helping CNP draft the proposal for the past two years, said the proposal is based off models from Seattle and Oakland. He said these proposals, though “not perfect,” have worked well in giving residents a voice about how they want to be policed. “Everybody says that Evanston is a progressive city, a welcoming city, so we need the actions of our lawmakers to really match that rhetoric,” Spillar said. At CNP’s meeting, residents also discussed the addition of a citizen-elected board that would monitor EPD activity and “work with residents and police to foster better relationships, build trust and improve the quality of service” that EPD currently provides. This board would be separate from the Citizens Police Advisory Committee, whose members are appointed by the mayor. Residents said a citizen-elected board would better represent Evanston. Betty Ester, a member of CNP, said Evanston “isn’t the same as it was when I came here” and that communities should play a greater role in advocating for themselves.